Example: Let's assume Employee 1 gets paid every two weeks, with gross pay of $2,000 and a 25% federal tax rate. In this case, Employee 1 would pay about $500 in taxes each pay period. Now let's assume Employee 2, who earns the same gross pay and has the same tax rate, contributes 6% of his salary each year to a retirement savings plan. In this instance, his gross pay would be reduced by $120 each pay period, resulting in a taxable income of $1,880. In this case, taxes would be $470--or $30 less than the previous scenario. 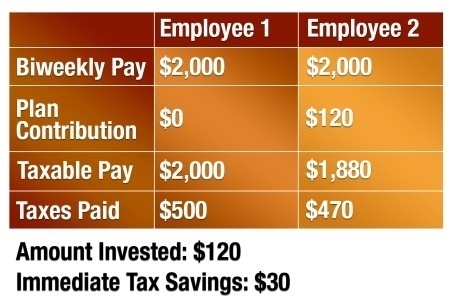 So Employee 2 would have invested $120 in a retirement savings plan and saved $30 in current income taxes. Tax deferral is the process of delaying (but not necessarily eliminating) the payment of income taxes on returns you earn. Whereas in taxable investment accounts, you would have to pay taxes on your earnings--even if you reinvest them--in a tax-deferred account, you can delay paying taxes on your returns until you withdraw money. For example, the money you put into your employer-sponsored retirement account isn't taxed until you withdraw it, which might be 30 or 40 years down the road! Let's assume two people have $5,000 to invest every year for a period of 30 years. One person invests in a tax-free account like a Roth 401(k) that earns 6% per year, and the other person invests in a taxable account (an investment account outside his or her retirement plan) that also earns 6% each year. 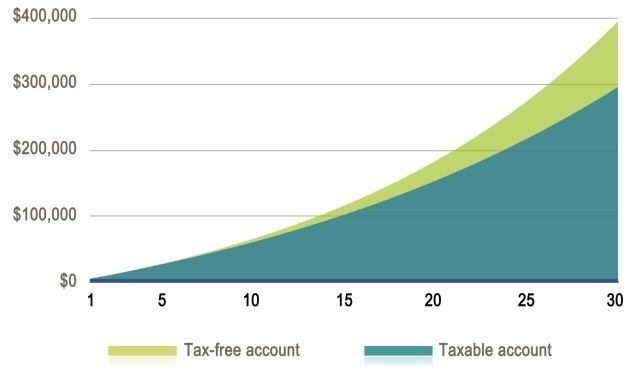 Assuming a tax rate of 28%, in 30 years the tax-free account will be worth $395,291, while the taxable account will be worth $295,896. That's a difference of $99,395. Individuals can contribute up to $18,000 (in 2016 and 2017) to a 401(k), 403(b), or 457 plan. The limit increases to $24,000 (in 2016 and 2017) for those age 50 or older. If your plan offers a Roth option, you can split your contributions between the traditional and Roth plans, but the total amount cannot exceed these limits. Be sure to check your plan's documents as some plans may impose lower limits. Even if you cannot contribute the maximum amount, be sure to contribute what you can. Through the power of compounding, even small amounts have the potential to add up over time. Then, try to increase your contribution whenever possible--for example, as you receive raises or pay off debts.